This is a collection of short stories that explores the themes of living, loving and dying—hence the catchy title. Chamberlain's writing is beautiful, making even the mundane sound inspiring. I felt like every sentence held meaning, and I sometimes re-read certain passages which begged to be scrutinized and appreciated. This doesn't mean that I cared or liked every character or situation in the stories but they certainly made me reflect. Stacking, one of my favorites, kept me turning the pages fast, a tale that expanded three generations. 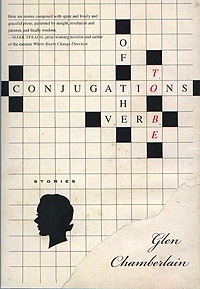 I got a few chuckles out of Conjugations of the Verb To Be--the introspective thoughts of an adjunct professor who teaches composition at the university, contemplating her life as she does a crossword puzzle. It made me wonder how much of it was from the author's own experience of teaching. Off the Road: or the Perfect Curve Unfound was another that I liked because the main character grew by the end of the story, and her experience made her a better person. With most of the stories, the reader is never sure where the author will take him. The stories are filled with descriptions of the Montana land and ranch life, making the author's love for this state obvious. The stories seem to touch each other even though only a few characters appear in more than one story. Most of all, I was taken by the author's imagination as she spun stories that were different, especially Twin Bridges, Montana about the orphans who find something unexpected under the pond's ice. The last story had a sadness to it, and I was sorry the collection ended this way, but it seemed to bring things full circle. This is a collection of interesting stories, with thought-provoking metaphors and a style of writing that is reflective, lyrical and rich. A reader cannot rush through it but is compelled to savor the words as they unfold into magnetic stories. Note: This book is rated P = Profanity for 2 f-words, a few religious expletives and a some crude words. Disclosure: Thanks to Kimberly Sorren from Delphinium Books for sending me this book for review. I was not compensated in any other way, nor told how to rate or review this product.